Note: Bending material before it is thoroughly heated will result in stress crazing (small internal fractures along the bend) Practice on scrap material first. Acrylic sheet in thickness greater than 1/4” should not be strip formed. Do not leave strip heater unattended. Work in a well-ventilated area. Have a general purpose ABC rated (dry power) fire extinguisher nearby. Do not heat acrylic sheet with an open flame or in kitchen ovens—such ovens are not equipped with adequate temperature controls and safety devices for this type of work. Center the two strips (2) on top of the base (1) leaving a 3/4” channel down the center and nail to the base. Attach a ground wire to the aluminum foil with a screw as shown. Note: The ground wire should be long enough to attach to a common ground such as the corner plate screw on an electrical outlet. For insulation, use fiberglass cloth (Refer to chart below) and fold to fit in the 3/4” channel on top of the aluminum foil. Staple fiberglass cloth and aluminum foil to 1/4” plywood strips (2) along the outside edges. Tape edge of fiberglass cloth and foil down to sides of wood to prevent fraying of edges. 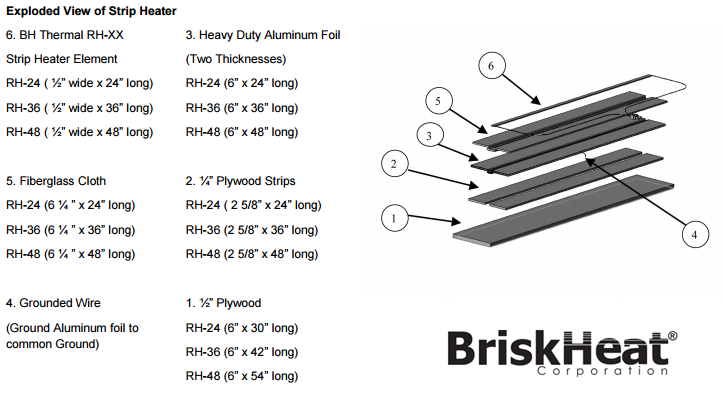 Lay the BriskHeat Strip Heater Element in the channel. Drive a nail 11 1/2” from each end of the base along a center line and tie end strings of the heating element to the nails. Plug the strip heater into 110V outlet. Acrylic sheet may be formed along a straight line by strip heating. Remove protective masking paper. Place acrylic sheet on the supporting frame with the area to be formed directly above the heating element—do not let the sheet touch the heating element. The material could not be heated to a temperature higher than 340°F. Surface overheating will cause scorching and bubbling; if this occurs, increase the distance between the heating element and the sheet. Allow the material to heat thoroughly (until it softens or welt in the area to be formed). Bend gently to the desired angle, keeping heated side of the material on the outside of the bend, and hold firmly until cool.